Maynard Life Outdoors and Hidden History of Maynard: Maynard Tear-Downs: History Lost or Good Riddance? Maynard Tear-Downs: History Lost or Good Riddance? 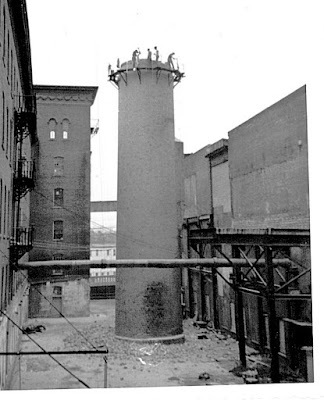 One of Maynard's two mill chimneys being removed in 1956.
fallen bricks and mortar. Click on photo to enlarge. Let’s start with a historic tear-down from October 1956. Prior to then, the mill complex had two tall chimneys of near-equal height, neither functional any more, one of yellow brick, on the north side of the windowless Building 9. Both chimneys dated to when coal-fueled steam engines powered the entire mill. Men climbed an iron-rung ladder affixed to the outside of the chimney. A ring of scaffolding was created at the top. The men used sledge hammers to knock bricks inward. At the bottom, a large hole had been made in one side, so the rubble could be wheel-barrow away and into trucks. The scaffolding was progressively lowered until the chimney was gone. The rubble was dumped into the mill pond to help create the parking lot used for the farmers’ market. At a later time the other chimney was shortened, capped, and had cell phone antennae added to the outside. In 2016 Mill & Main removed Buildings 10 and 2A as part of a plan to open up the complex to Main Street, with intention to add retail and restaurant businesses. Extensive landscaping was completed in 2018, but for now, no retail. What was lost? Both buildings were of brick and timber construction, two stories tall, size roughly 15x40 yards, exterior walls incorporating roughly 100,000 bricks. Maynard Historical Society records tentatively date both ex-buildings to 1887, but the well-known aerial view image from 1879 shows what looks like Building 2A already in place. Taking the entire mill into account, the existing buildings range from 1859 to 1918 (clocktower 1892). Brick wall from Building 2A. Elsewhere in Manyard, there has been a series of commercial building tear-downs catalyzed by Jimmy MacDonald’s desire to meet rental demands by constructing brick three- or four-story apartment buildings. His efforts began at 60 Summer Street in 2004, continued at the corner of Waltham and Parker Streets, then to 10-12 Main Street. In all of these instances, empty or marginal wood-frame buildings were torn down. Were they historic? Perhaps. Salvageable? Unlikely. MacDonald’s current plans involve the Gruber Bros Furniture building on Main Street and 42 Summer Street. Parts of Gruber Bros date to the late 1800s, but a major fire in 1934 and multiple remodelings since left little that could be considered historic. The yellow building at 42 Summer Street, originally a private dwelling, then the W.A. Twombly Funeral Home, most recently a consignment shop, is also heading for a resurrection as a brick box of apartments. On the other hand, MacDonald bought the run-down apartment building at 145 Main Street, originally the home of Amory Maynard in the 1860s, and did a make-over rather than a tear-down. He also did rehabs of several old but less historically significant woodframe buildings on Florida Street. pieces of concrete were falling on cars parked underneath. The previous Maynard High School (1964-2013) is a memory, as is Memorial Gym, once upon a time adjacent to ArtSpace, gone in 2012. The school was replaced, the gym not. The two-level parking garage off Nason Street vanished in 2014 leaving behind a structure to hold the electric car charging apparatus. Removing any evidence of a railroad was a years long process. Passenger service from Maynard ended in 1958. The train station was demolished in 1960. Twenty years later the elevated berm behind The Outdoor Store was removed to create a parking lot, also removed at that time the railroad bridges over the Assabet River and Florida Street. The last vestiges of railroad track were removed for scrap steel in 2014, making way for the Assabet River Rail Trail. While Maynard’s business buildings at times disappeared with barely a whimper, private house tear-downs are a rarity. The main reason for this is small lots. Neighboring towns with higher value real estate often have modest, older houses, on sizable lots. Zoning may allow destruction of the existing house, to be replaced by a much larger house – possibly even to the maximum size zoning for that lot allows. Even if there are zoning restrictions to keeping the ‘footprint’ of the new house to the foundation of the old house, zoning boards can be lenient in granting exceptions. The reasoning behind this is that replacement with larger single-family dwelling is unlikely to add to the town’s infrastructure or school budgets, whereas an increase in property tax will apply. of the eight Maynard men who died in World War I. There are exceptions. Earlier this year a mansard-roofed house in a state of disrepair, but dating to the 1870s, was torn down and replaced by a nondescript two-story house. The building in question was at 71 Summer Street, just west of ArtSpace. It was one of fewer than ten mansard-roofed homes in Maynard (a trio of which grace the south end of Maple Street). Towns can establish historic districts in an effort to retain a commonality of ‘feel’ to neighborhoods and business districts, or else identify individual buildings as having historic value. The Maynard Historical Commission (MHC) has established a list of some 50 or so historically significant properties in Maynard. The list (available on the town’s website) includes a handful of houses that pre-date 1800 and many of the commercial buildings flanking Main, Nason and Summer Streets. Sometimes the original function is gone but the exterior remains, examples being St. George’s Episcopal Church on Summer Street, now condominium apartments, and Roosevelt School, now the Maynard Public Library. The by-law was approved at a Town Meeting in January 2017. The bylaw’s purpose is to preserve and protect significant buildings or other structures within the Town of Maynard which constitute or reflect distinctive features of the architectural, cultural, economic, political or social history of the Town. Owners of what have been identified as buildings that should be preserved are encouraged to consider rehabilitation and restoration of the exteriors of buildings. Demolitions can be delayed for a period of time. Specifically, if a demolition permit is requested and the building is on the significant properties list, an addendum must be filed and then reviewed by the Historical Commission to determine if the building is still considered significant. Next, goes to a public hearing. If that favors preservation there is a delay of up to twelve months while MHC works with the applicant to see if there is an alternative to demolition. If yes, saved. If not, not, and demolition can proceed. Lastly, if a building owner ignores the demolition delay process and tears down the building, a two-year delay will be imposed on getting a building permit to build on that site. Maynard Historical Marker - Fine Arts Theater. and before that horse livery (all same family). The Commission also created a Historical Marker Program in 2012 to highlight important buildings and landmarks with permanent historical markers. Examples can be seen on the exterior of the Fine Arts Theater and The Outdoor Store. Residents throughout the town can also contact the MHC to have a thorough history review done on their own private property and celebrate their home with a plaque. The closest Maynard has to a historic district is Presidental Village, so-named due to the streets being named after presidents. The neighborhood has its own Wikipedia entry, but no official designation from the town. This was a fun read. I've seen a few old homes torn down in recent years. At least two on rt 27 in the north part of town, replaced with giant homes, and one next to the Russian church, the replacement home there is still under construction, and of course the duplexes/tenements demolished for the walgreens building (hope Acton ct isn't next!). I have a few long time neighbors on my street who have modest old homes on large for Maynard lots, keeping my fingers crossed they don't get purchased for investment and demolition when the time comes for my neighbors to sell.